There are two basic precipitation generation types which are dynamic precipitation and convective precipitation. Dynamic precipitation is also known as stratiform precipitation. Dynamic precipitation results from a forced lifting of air. 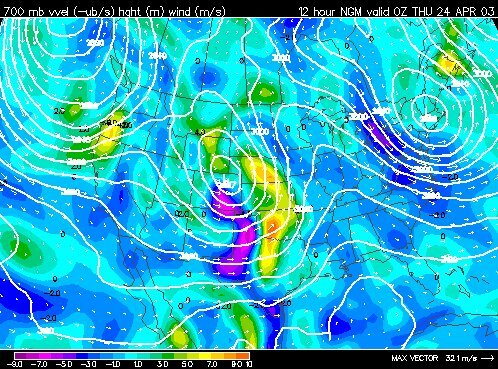 These forcing mechanisms include processes that cause low level convergence and upper level divergence. As unsaturated air rises the relative humidity of the air will increase. Once the air saturates, continued lifting will produce clouds and eventually precipitation. Dynamic precipitation tends to have a less intense rain rate than convective precipitation and also tends to last longer. Convective precipitation is also known as thermodynamic precipitation. While dynamic precipitation only needs saturated air and lift, convective precipitation requires an additional component called instability. Uplift due to instability release occurs when the air rises on its own after being lifting to a certain point in the troposphere. Instability is commonly assessed by examining the Lifted Index (LI) and CAPE (Convective Available Potential Energy). Both these indices can be used to assess the acceleration rate of air once air from the lower troposphere is brought to a level in the troposphere where it will rise on its own due to positive buoyancy. Instability causes the air to rise much faster than it would by forced lifting alone. Think of convective precipitation as falling from thunderstorms with strong updrafts while dynamic precipitation falls from a deck of stratus clouds. Convective precipitation tends to have lighting, thunder and heavy rain while dynamic precipitation is more of a gentle long lasting rain with no lightning and thunder. Below this short essay are 6 forecast model images from 0Z. These images will be referenced throughout the rest of this essay. Let us look at two regions of precipitation and determine which region will have dynamic precipitation and which region will have convective precipitation. On the image labeled "precipitation" notice the area of precipitation in Washington State and Oregon and also notice the region of precipitation over the plains states. Both regions of precipitation have forced lifting which is causing the air to rise. See the image labeled "forced lifting". 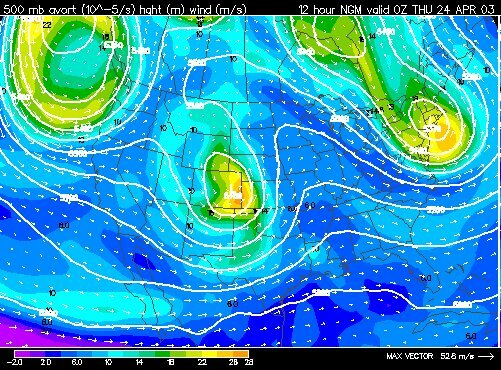 The lifting in the plains is caused by the low pressure region, warm air advection, convergence along a dryline and front, and positive vorticity advection. Look for these lifting mechanisms on the images labeled "low level moisture and convergence" and "vorticity". The lifting in Washington and Oregon is caused by topographic uplift, a frontal boundary coming off the ocean and positive vorticity advection. Look at the images below to see these lifting processes. The last two images assess instability. The image labeled "lifted index" shows the regions of instability in regions with the dark hatching. This region of instability extends from the Gulf of Mexico and into the plains states. The image labeled "CAPE" shows instability in this same region. 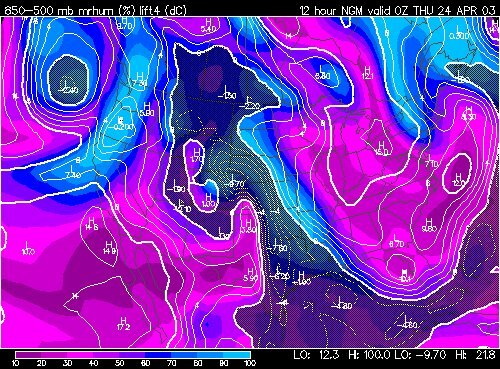 Notice that over Washington and Oregon that there is no instability. 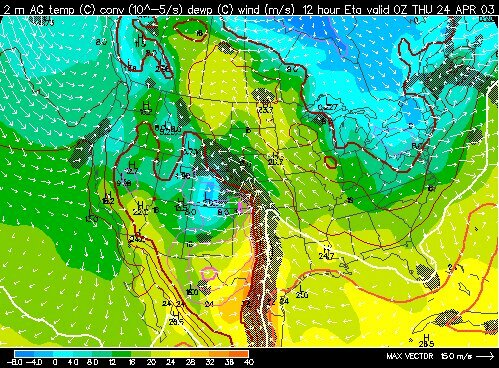 Notice the low level dewpoints are much higher over the plains states than they are over the Pacific northwest. High dewpoints are one factor that increases instability. From this information we can determine that the precipitation over the plains states will have convection embedded within it while the precipitation in Washington and Oregon will be stratiform in nature. There is saturated air, lifting and instability over the plains states while there is just saturated air and lifting in Washington and Oregon.